Hodie 3a vice lecta est Billa, intituled, An Act for continuing the several Laws therein mentioned, relating to the Premiums upon the Importation of Masts, Yards, and Bowsprits, Tar, Pitch, and Turpentine; to British-made Sail Cloth, and the Duties payable on Foreign Sail Cloth; to the Greenland and to the Whale Fishery; for granting a further Bounty for all Ships employed in the Whale Fishery during the present War; for exempting Harponeers and others employed in the Greenland Fishery Trade from being impressed; and for giving further Time for the Payment of Duties omitted to be paid for the Indentures and Contracts of Clerks and Apprentices." Message from thence, to return Conyer's, &c. Bill. To return the Bill, intituled, "An Act for confirming and establishing certain Articles of Agreement, made between Maurice Conyers Esquire, Lord of the Manor of Rusthall, in the County of Kent, and the Right Honourable William Lord Abergavenny, and other Freehold Tenants of the said Manor, relating to certain Buildings and Enclosures made and erected in and upon Part of the Wastes of the said Manor; and for making the said Agreement more effectual for the Purposes thereby intended;" and to acquaint this House, that they have agreed to the same without any Amendment. With a Bill, intituled, "An Act for the better and more easy collecting of Charity-money on Briefs." Vernon's Petition, Report concerning; and Counsel to be heard. 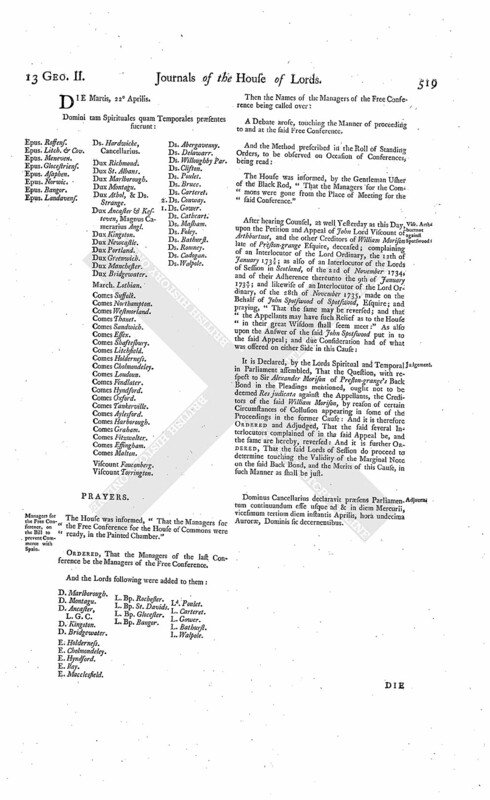 The Earl of Findlater reported from the Lords Committees appointed to consider of the Petition of Jane Vernon Widow, Executrix and Devisee of Thomas Vernon Esquire, deceased; praying Leave, "In regard to the particular Circumstances of the Case, to bring an Appeal against a Decree of Dismission of the Court of Chancery in Ireland, made the 14th of May 1686, notwithstanding the Standing Order of this House, limiting the Number of Years for bringing Appeals;" and to whom was also referred the Petition of Captain John Vernon, by Way of Answer thereto: "That the Committee have met, upon the Matter to them referred; and have heard One Counsel of a Side for the said Petitioners; and, upon Consideration of the Case, their Lordships have not thought proper to report any Opinion; but have directed the State of the Case to be reported specially to the House." Ordered, That One Counsel of a Side may be heard, at the Bar of this House, in relation to this Matter, on Friday next, if they think fit. The House being informed, "That Mr. Brereton attended, in order to deliver in several Papers and Proceedings, in the Cause wherein Nathaniel Bland Doctor of Laws is Appellant, and Hugh Lord Archbishop of Ardmagh and others are Respondents:"
He was called in; and delivered, at the Bar, the said Papers and Proceedings; and attested upon Oath, "The same were true Copies, he having examined them with the Originals in the proper Offices in Ireland." It is Ordered, That the further Hearing of this Cause be adjourned till To-morrow; and that the Counsel be called in at One o'Clock. Dominus Cancellarius declaravit præsens Parliamentum continuandum esse usque ad et in diem Martis, vicesimum secundum diem instantis Aprilis, hora undecima Auroræ, Dominis sic decernentibus. Managers for the Free Conference, on the Bill to prevent Commerce with Spain. The House was informed, "That the Managers for the Free Conference for the House of Commons were ready, in the Painted Chamber." Ordered, That the Managers of the last Conference be the Managers of the Free Conference. D. Ancaster, L. G. C.
E. Macclesfield. L. Bp. Rochester. L. Bp. Bangor. Ld. Poulet. A Debate arose, touching the Manner of proceeding to and at the said Free Conference. The House was informed, by the Gentleman Usher of the Black Rod, "That the Managers for the Commons were gone from the Place of Meeting for the said Conference." 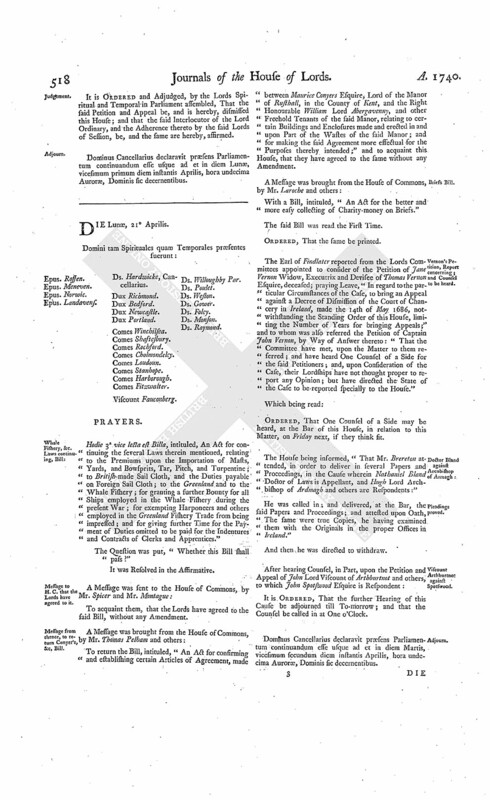 It is Declared, by the Lords Spiritual and Temporal in Parliament assembled, That the Question, with respect to Sir Alexander Morison of Preston-grange's Back Bond in the Pleadings mentioned, ought not to be deemed Res judicata against the Appellants, the Creditors of the said William Morison, by reason of certain Circumstances of Collusion appearing in some of the Proceedings in the former Cause: And it is therefore Ordered and Adjudged, That the said several Interlocutors complained of in the said Appeal be, and the same are hereby, reversed: And it is further Ordered, That the said Lords of Session do proceed to determine touching the Validity of the Marginal Note on the said Back Bond, and the Merits of this Cause, in such Manner as shall be just. Dominus Cancellarius declaravit præsens Parliamentum continuandum esse usque ad & in diem Mercurii, vicesimum tertium diem instantis Aprilis, hora undecima Auroræ, Dominis sic decernentibus. Message from H. C. to return the Governors of the Foundling Hospital Bill. To return the Bill, intituled, "An Act for confirming and enlarging the Powers granted by His Majesty to the Governors and Guardians of the Hospital for the Maintenance and Education of exposed and deserted Young Children, by His most Gracious Charter, bearing Date the Seventeenth Day of October, in the Year of our Lord One Thousand Seven Hundred and Thirty-nine; and to enable them to execute the good Purposes of the said Charter;" and to acquaint this House, that they have agreed to their Lordships (fn. 1) Amendments to One of their Amendments made to the said Bill. E. of Essex takes the Oaths. William Earl of Essex took the Oaths, and made and subscribed the Declaration, and also took and subscribed the Oath of Abjuration, pursuant to the Statutes; his Lordship having first delivered a Certificate of his receiving the Sacrament, to the Truth whereof Witnesses were sworn and examined. Message to H. C. for a Free Conference on the Bill to prevent Commerce with Spain. Ordered, That a Message be sent to the House of Commons, to acquaint them, "That the Lords were prevented, by extraordinary Business, from meeting the Commons Yesterday, at a Free Conference, as was desired by them; and that their Lordships do appoint the said Free Conference presently, in the Painted Chamber." And a Message was accordingly sent to the House of Commons, by Mr. Edwards and Mr. Sawyer, for that Purpose. Ordered, That the Bill, intituled, "An Act for the better and more easy collecting of Charity-money on Briefs," be read a Second Time on this Day Fortnight. The Messengers sent to the House of Commons being returned, acquainted the House, "That the Commons will meet their Lordships presently, at the Free Conference, as appointed." The House being informed, "That the Managers of the Free Conference for the Commons were ready, in the Painted Chamber:"
The Names of the Managers for the Lords were called over. Then the House was adjourned during Pleasure, and the Lords went to the Free Conference; and proceeded in the usual Manner into the Painted Chamber, covered. "Line 6. Leave out ["were"], and insert ["shall be"]. "L. 8 and 9. Leave out ["and there landed or loaded on Board some British Ship or Vessel"]. "L. 9 and 10. Leave out ["26th"], and insert ["First"]. "L. 10. Leave out ["February"], and insert ["May"]. "L. 11. Leave out ["Thirty-nine"], and insert ["Forty"]. "L. 18. After ["them"], insert ["in the Port of London, or before the Collector and Comptroller of the Customs in any other Port of Great Britain"]. "L. 24 and 25. Leave out ["and there landed or loaded on Board some British Ship or Vessel"]. "L. 25. Leave out ["26th"], and insert ["First"]. "L. last. Leave out ["February"], and insert ["May"]. 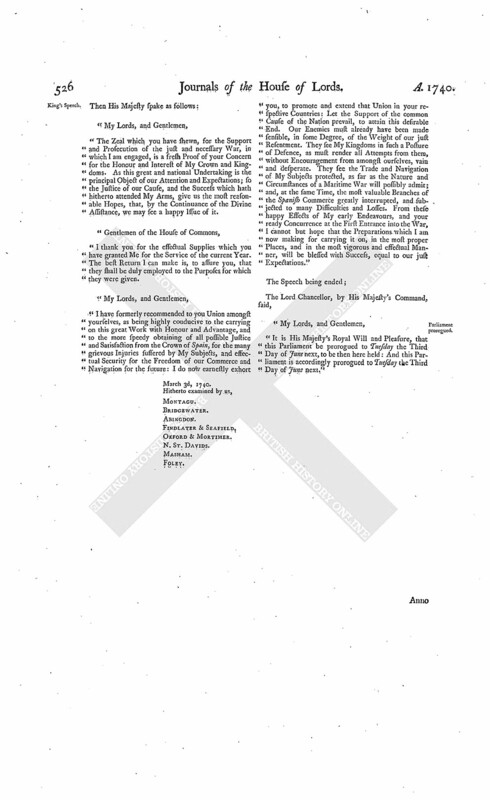 "The Managers for the Commons did moreover observe, that there was a great Difference between the Provisions in this Bill, and the Provisions in the Act of the 3d and 4th Years of the Reign of Queen Anne, for prohibiting Commerce with France, both with respect to the Commodities thereby prohibited, as touching the Proof to be made of the Time of the Goods being imported; and concluded, with expressing their Hopes, that your Lordships will not insist on your said First Amendment, and also agree to the said Amendments made by the Commons to Clause (A). "Upon which, your Lordships Managers acquainted the Managers for the Commons, That they having offered new Matter, concerning which your Managers had no Instructions from your Lordships, they could not take upon them to make an immediate Answer thereto; but would report the same to the House." Ordered, That the said Report be taken into Consideration To-morrow; and that the said Mr. Alderman Lambert, Mr. Josiah Chitty, Mr. Henry Vanderstagen, Mr. Foster, and Mr. Campbell, do then attend this House. Dominus Cancellarius declaravit præsens Parliamentum continuandum esse usque ad & in diem Jovis, vicesimum quartum diem instantis Aprilis, hora undecima Auroræ, Dominis sic decernentibus. The House (according to Order) proceeded to take into Consideration the Report of the Free Conference had with the Commons Yesterday, upon the Subjectmatter of the former Conferences. And the Merchants attending, according to the Order Yesterday, were called in, and examined, at the Bar, touching any and what Quantities of Spanish Goods or Commodities remained beyond Sea, or on Board, and other Matters: And they acquainted the House, "There were great Quantities Abroad;" and also mentioned great Difficulties they met with, in procuring Shipping for the Importation thereof. Then it being moved, "Not to adhere to the Amendment made by this House to the Bill, intituled, "An Act for prohibiting Commerce with Spain," whereby it was agreed to leave out ["June"], and insert ["May"] instead thereof:"
The same was agreed to. And then the several Amendments made by the Commons to Clause (A), added by this House to the said Bill, were read, and also agreed to. Message to H. C. to acquaint them with it. To acquaint them, that the Lords do not insist on the said Amendment made by their Lordships; and do agree to the Amendments made by the Commons to Clause (A). Dominus Cancellarius declaravit præsens Parliamentum continuandum esse usque ad & in diem Veneris, vicesimum quintum diem instantis Aprilis, hora undecima Auroræ, Dominis sic decernentibus. List of the General Officers of the Army delivered. The House being informed, "That Mr. Arnold, from the Office of Secretary of War, attended:"
"A List of the General Officers of the Army, according to their Rank; with the Dates of their respective Commissions." Mrs Vernon, Leave to appeal. As was also the Counsel for the said Captain Vernon; who, in the Course of his Pleading, waived insisting on the said Standing Order. It is Ordered, That the Petitioner Mrs. Vernon be at Liberty to exhibit an Appeal from the said Decree, or Order of Dismission, of the Court of Chancery in Ireland, if she thinks fit. Dominus Cancellarius declaravit præsens Parliamentum continuandum esse usque ad & in diem Lunæ, vicesimum octavum diem instantis Aprilis, hora undecima Auroræ, Dominis sic decernentibus. Ivers, to examine aged and infirm Witnesses. A Petition of Thomas Ivers Esquire, Respondent to the Appeal of Sir William Barker Baronet, was presented to the House, and read; praying, "In regard the Appellant has delayed bringing his Appeal to an Hearing this Session; that the Petitioner may be at Liberty to proceed in the Cause, in the Court of Chancery in Ireland, so far as to examine Witnesses, who are old or infirm, in relation to Assets of the Appellant's late Father." And the Petitioner's Agent delivering in an Affidavit, made by the Petitioner, in relation to this Matter, the same was read. Ordered, That the said Court of Chancery be at Liberty to permit the Petitioner, upon Motion to that Court, to examine such of his Witnesses as he shall make appear to them to be aged and infirm, according to the Course of the said Court, as that Court shall think just, notwithstanding the Pendency of the said Appeal. Coals, Price to be set on them, Bill. With a Bill, intituled, "An Act to empower the Court of Lord Mayor and Aldermen of the City of London to set the Price upon all Coals, commonly called Sea Coals, imported into the Port of London; and to settle the Wages of Labourers employed in delivering any Coal Ships in the River of Thames; and to oblige Fitters and others, vending and loading Ships with Sea Coals at Newcastle, and the Ports adjacent thereunto, to deliver such Coals to the Masters of any Ships applying for the same;" to which they desire the Concurrence of this House. Lords added to Committee Journal. Ordered, That all the Lords who have been present in this House this Session of Parliament, and are not of the Committee appointed the First Day of this Session to peruse and perfect the Journal of this and former Sessions of Parliament, be added to the said Committee. Dominus Cancellarius declaravit præsens Parliamentum continuandum esse usque ad & in diem Martis, vicesimum nonum diem instantis Aprilis, hora undecima Auroræ, Dominis sic decernentibus. The House was adjourned during Pleasure, to robe. His Majesty, being seated on His Throne, adorned with His Crown and Regal Ornaments, and attended with His Officers of State; the Prince of Wales, in his Robes, sitting in his Place on His Majesty's Right Hand; the Lords being also in their Robes; commanded the Gentleman Usher of the Black Rod to let the Commons know, "It is His Majesty's Pleasure, that they attend Him immediately, in this House." "1. An Act for granting to His Majesty the Sum of One Million, out of the Sinking Fund, for the Service of the Year One Thousand Seven Hundred and Forty; and for enabling His Majesty to raise the further Sum of Two Hundred Thousand Pounds, out of the growing Produce of the said Fund; and for granting to His Majesty the Sum of Twenty-one Thousand Pounds, One Shilling, and Eight Pence Half-penny, remaining in the Receipt of His Majesty's Exchequer, arisen by Sale of Lands in the Island of St. Christophers; and for the further appropriating the Supplies granted in this Session of Parliament." "2. 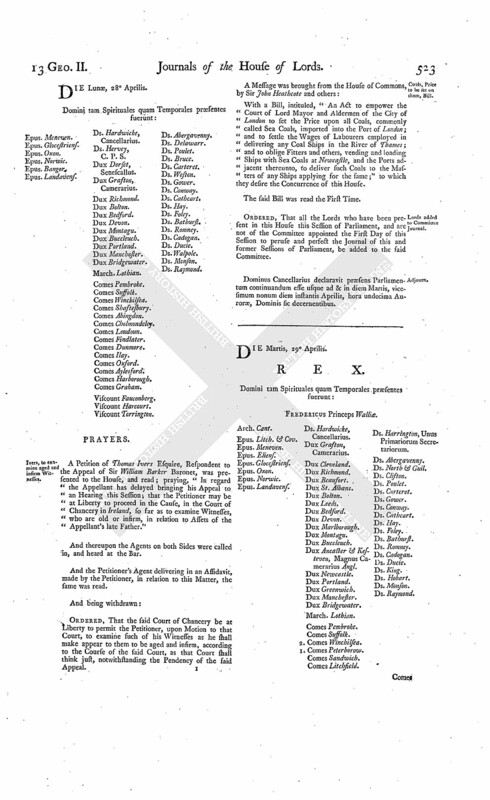 An Act for continuing the several Laws therein mentioned, relating to the Premiums upon the Importation of Masts, Yards, and Bowsprits, Tar, Pitch, and Turpentine; to British-made Sail Cloth, and the Duties payable on Foreign Sail Cloth; to the Greenland and to the Whale Fishery; for granting a further Bounty for all Ships employed in the Whale Fishery during the present War; for exempting Harponeers and others, employed in the Greenland Fishery Trade, from being impressed; and for giving further Time for the Payment of Duties omitted to be paid for the Indentures and Contracts of Clerks and Apprentices." "Le Roy remercie ses bons Sujets, accepte leur Benevolence, & ainsi le veult." "3. An Act for prohibiting Commerce with Spain." "4. An Act for amending and enforcing the Laws relating to Rogues, Vagabonds, and other idle and disorderly Persons; and for reducing the same into One Act of Parliament; and also for amending the Laws for erecting, providing, and regulating, Houses of Correction." "5. An Act to restrain and prevent the excessive Increase of Horse-races; and for amending an Act made in the last Session of Parliament, intituled, An Act for the more effectual preventing of excessive and deceitful Gaming." "6. An Act for further and more effectually preventing the wilful and malicious Destruction of Collieries and Coal-works." "7. An Act to continue several Laws therein mentioned, for punishing such Persons as shall wilfully and maliciously pull down or destroy Turnpikes for repairing Highways, or Locks or other Works erected by Authority of Parliament for making Rivers navigable; for preventing Exactions of the Occupiers of Locks and Wears upon the River of Thames Westward, and for ascertaining the Rates of Water-carriage upon the said River; for preventing frivolous and vexatious Arrests; and for better securing the lawful Trade of His Majesty's Subjects to and from The East Indies, and for the more effectual preventing all His Majesty's Subjects trading thither under Foreign Commissions; and for limiting the Time for suing forth Writs of Certiorari upon Proceedings before Justices of the Peace, and for regulating the Time and Manner of applying for the same; for the better and more speedy Execution of Process within particular Franchises or Liberties; and for extending the Powers and Authorities of Justices of the Peace of Counties, touching County Rates, to the Justices of the Peace of such Liberties and Franchises as have Commissions of the Peace within themselves." "8. An Act for the Increase of Mariners and Seamen, to navigate Merchant Ships, and other Trading Ships or Vessels." "9. An Act for more effectually preventing fraudulent Qualifications of Persons to vote as Freeholders, in the Election of Members to serve in Parliament, for such Cities and Towns as are Counties of themselves, in that Part of Great Britain called England." "10. 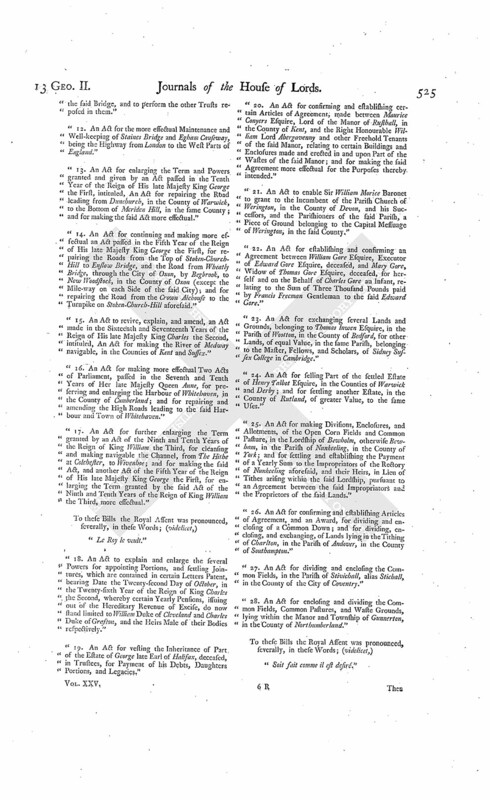 An Act for confirming and enlarging the Powers granted by His Majesty to the Governors and Guardians of the Hospital for the Maintenance and Education of exposed and deserted young Children, by His most Gracious Charter, bearing Date the Seventeenth Day of October, in the Year of our Lord One Thousand Seven Hundred and Thirty-nine; and to enable them to execute the good Purposes of the said Charter." "11. 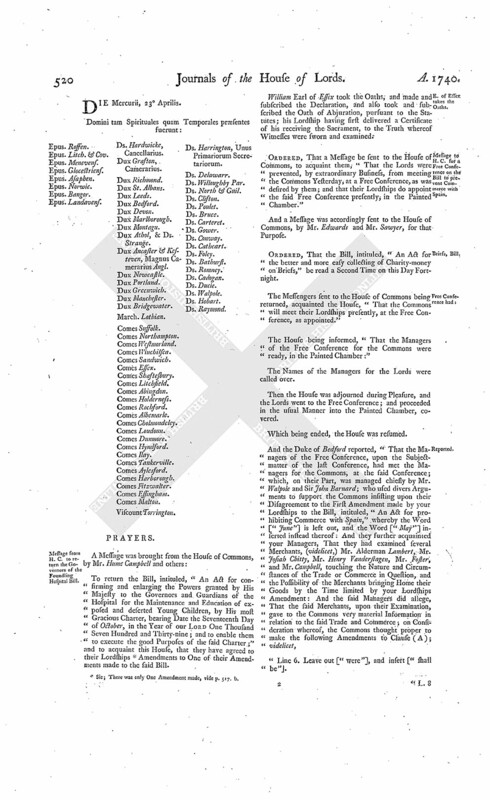 An Act to give further Powers to the Commissioners for building a Bridge cross the River Thames, from the City of Westminster to the opposite Shore in the County of Surrey; and to enable them to raise a further Sum of Money, towards finishing the said Bridge, and to perform the other Trusts reposed in them." "12. An Act for the more effectual Maintenance and Well-keeping of Staines Bridge and Egham Causeway, being the Highway from London to the West Parts of England." "13. 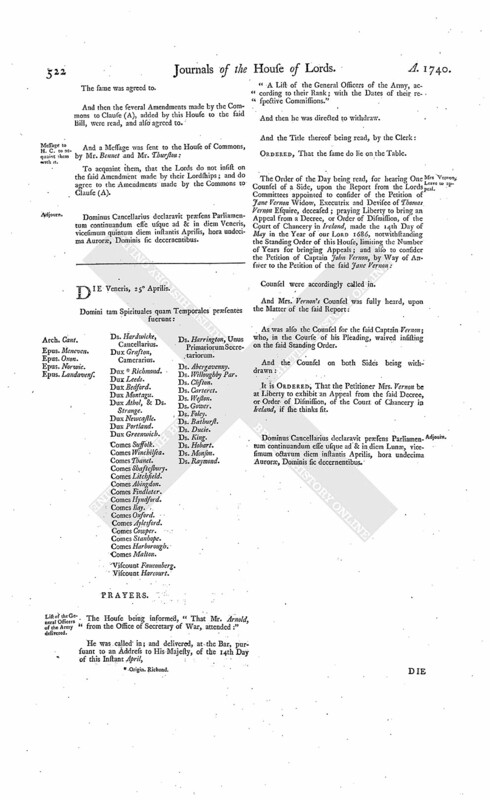 An Act for enlarging the Term and Powers granted and given by an Act passed in the Tenth Year of the Reign of His late Majesty King George the First, intituled, An Act for repairing the Road leading from Dunchurch, in the County of Warwick, to the Bottom of Meriden Hill, in the same County; and for making the said Act more effectual." "14. An Act for continuing and making more effectual an Act passed in the Fifth Year of the Reign of His late Majesty King George the First, for repairing the Roads from the Top of Stoken-ChurchHill to Enslow Bridge, and the Road from Wheatly Bridge, through the City of Oxon, by Begbrook, to New Woodstock, in the County of Oxon (except the Mile-way on each Side of the said City); and for repairing the Road from the Crown Alehouse to the Turnpike on Stoken-Church-Hill aforesaid." "15. An Act to revive, explain, and amend, an Act made in the Sixteenth and Seventeenth Years of the Reign of His late Majesty King Charles the Second, intituled, An Act for making the River of Medway navigable, in the Counties of Kent and Sussex." "16. An Act for making more effectual Two Acts of Parliament, passed in the Seventh and Tenth Years of Her late Majesty Queen Anne, for preserving and enlarging the Harbour of Whitehaven, in the County of Cumberland; and for repairing and amending the High Roads leading to the said Harbour and Town of Whitehaven." "17. An Act for further enlarging the Term granted by an Act of the Ninth and Tenth Years of the Reign of King William the Third, for cleansing and making navigable the Channel, from The Hithe at Colchester, to Wivenhoe; and for making the said Act, and another Act of the Fifth Year of the Reign of His late Majesty King George the First, for enlarging the Term granted by the said Act of the Ninth and Tenth Years of the Reign of King William the Third, more effectual." "18. 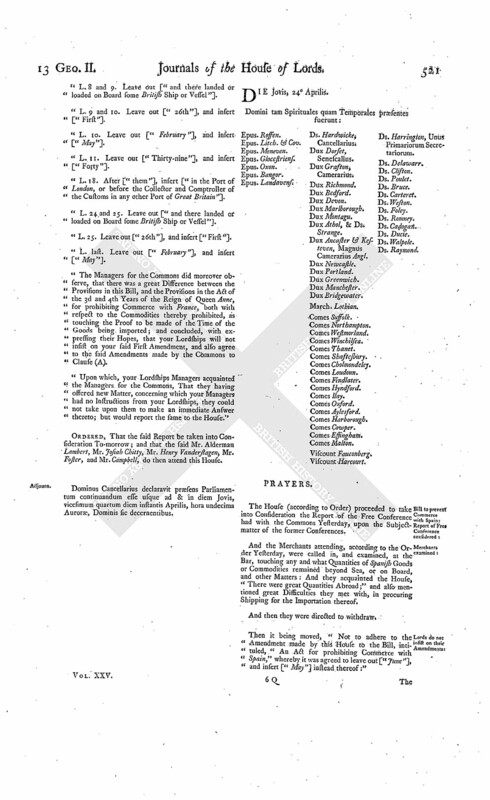 An Act to explain and enlarge the several Powers for appointing Portions, and settling Jointures, which are contained in certain Letters Patent, bearing Date the Twenty-second Day of October, in the Twenty-sixth Year of the Reign of King Charles the Second, whereby certain Yearly Pensions, issuing out of the Hereditary Revenue of Excise, do now stand limited to William Duke of Cleveland and Charles Duke of Grafton, and the Heirs Male of their Bodies respectively." "19. An Act for vesting the Inheritance of Part of the Estate of George late Earl of Halifax, deceased, in Trustees, for Payment of his Debts, Daughters Portions, and Legacies." "20. 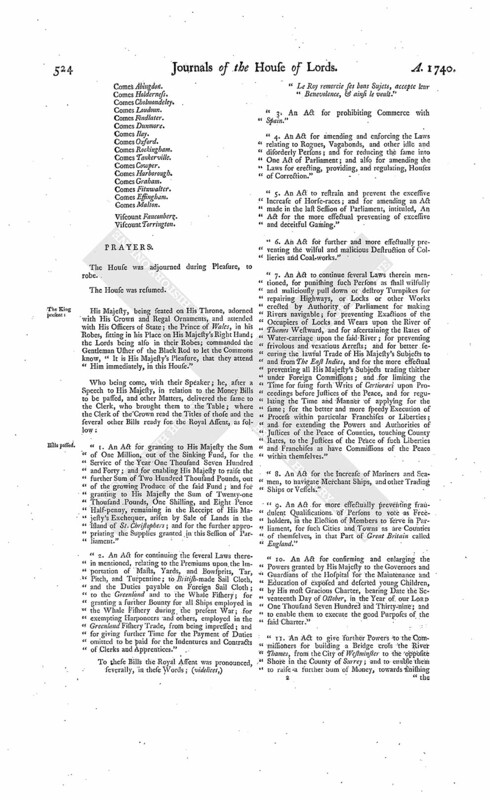 An Act for confirming and establishing certain Articles of Agreement, made between Maurice Conyers Esquire, Lord of the Manor of Rusthall, in the County of Kent, and the Right Honourable William Lord Abergavenny and other Freehold Tenants of the said Manor, relating to certain Buildings and Enclosures made and erected in and upon Part of the Wastes of the said Manor; and for making the said Agreement more effectual for the Purposes thereby intended." "21. An Act to enable Sir William Morice Baronet to grant to the Incumbent of the Parish Church of Werington, in the County of Devon, and his Successors, and the Parishioners of the said Parish, a Piece of Ground belonging to the Capital Messuage of Werington, in the said County." "22. An Act for establishing and confirming an Agreement between William Gore Esquire, Executor of Edward Gore Esquire, deceased, and Mary Gore, Widow of Thomas Gore Esquire, deceased, for herself and on the Behalf of Charles Gore an Infant, relating to the Sum of Three Thousand Pounds paid by Francis Freeman Gentleman to the said Edward Gore." "23. An Act for exchanging several Lands and Grounds, belonging to Thomas Inwen Esquire, in the Parish of Wootton, in the County of Bedford, for other Lands, of equal Value, in the same Parish, belonging to the Master, Fellows, and Scholars, of Sidney Sussex College in Cambridge." "24. An Act for selling Part of the settled Estate of Henry Talbot Esquire, in the Counties of Warwick and Derby; and for settling another Estate, in the County of Rutland, of greater Value, to the same Uses." "25. An Act for making Divisions, Enclosures, and Allotments, of the Open Corn Fields and Common Pasture, in the Lordship of Bewholm, otherwise Bewham, in the Parish of Nunkeeling, in the County of York; and for settling and establishing the Payment of a Yearly Sum to the Impropriators of the Rectory of Nunkeeling aforesaid, and their Heirs, in Lieu of Tithes arising within the said Lordship, pursuant to an Agreement between the said Impropriators and the Proprietors of the said Lands." "26. An Act for confirming and establishing Articles of Agreement, and an Award, for dividing and enclosing of a Common Down; and for dividing, enclosing, and exchanging, of Lands lying in the Tithing of Charlton, in the Parish of Andover, in the County of Southampton." "27. An Act for dividing and enclosing the Common Fields, in the Parish of Stivichall, alias Stichall, in the County of the City of Coventry." "28. An Act for enclosing and dividing the Common Fields, Common Pastures, and Waste Grounds, lying within the Manor and Township of Gunnerton, in the County of Northumberland." "Soit fait comme il est desiré." "The Zeal which you have shewn, for the Support and Prosecution of the just and necessary War, in which I am engaged, is a fresh Proof of your Concern for the Honour and Interest of My Crown and Kingdoms. As this great and national Undertaking is the principal Object of our Attention and Expectations; so the Justice of our Cause, and the Success which hath hitherto attended My Arms, give us the most reasonable Hopes, that, by the Continuance of the Divine Assistance, we may see a happy Issue of it. "I thank you for the effectual Supplies which you have granted Me for the Service of the current Year. The best Return I can make is, to assure you, that they shall be duly employed to the Purposes for which they were given. "I have formerly recommended to you Union amongst yourselves, as being highly conducive to the carrying on this great Work with Honour and Advantage, and to the more speedy obtaining of all possible Justice and Satisfaction from the Crown of Spain, for the many grievous Injuries suffered by My Subjects, and effectual Security for the Freedom of our Commerce and Navigation for the future: I do now earnestly exhort you, to promote and extend that Union in your respective Countries: Let the Support of the common Cause of the Nation prevail, to attain this desirable End. Our Enemies must already have been made sensible, in some Degree, of the Weight of our just Resentment. They see My Kingdoms in such a Posture of Defence, as must render all Attempts from them, without Encouragement from amongst ourselves, vain and desperate. They see the Trade and Navigation of My Subjects protected, as far as the Nature and Circumstances of a Maritime War will possibly admit; and, at the same Time, the most valuable Branches of the Spanish Commerce greatly interrupted, and subjected to many Difficulties and Losses. From these happy Effects of My early Endeavours, and your ready Concurrence at the First Entrance into the War, I cannot but hope that the Preparations which I am now making for carrying it on, in the most proper Places, and in the most vigorous and effectual Manner, will be blessed with Success, equal to our just Expectations." "It is His Majesty's Royal Will and Pleasure, that this Parliament be prorogued to Tuesday the Third Day of June next, to be then here held: And this Parliament is accordingly prorogued to Tuesday the Third Day of June next." 1. Sic; There was only One Amendment made, vide p. 517. b.